As much as they've improved over the past decade, weather forecasts still aren't completely reliable. According to ForecastWatch, only 15.7% of one-day forecasts are 'perfect,' offering a temperate prediction that's less than 1℉ off-target. Given that such forecasts deal with natural systems that, unlike social systems, don't react to the predictions made about them, their imperfection underlines the difficulty of divining the future of something much vaguer, much more subjective, much more self-reflexive, and much more determined by factors that can't be quantified. Yet as foolish as it would be to predict the movements of the cryptocurrency markets and to even broadcast such predictions to the public, this hasn't stopped countless numbers of 'cryptocurrency experts' from making and broadcasting such predictions. And as more skeptical readers may have already realized, these predictions are almost always wrong. But in a climate where the public are eager to jump on the cryptocurrency gravy train, and where there's much to be gained by whipping up a bullish mood, they aren't going to stop anytime soon. If there's one 'crypto analyst' who's especially prominent and virtually always wrong, it's Brian Kelly. 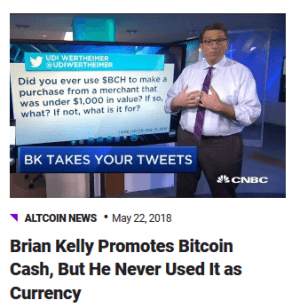 The founder and CEO of digital-asset investment firm BKCM LLC, Brian Kelly has generally been CNBC's go-to expert whenever it has wanted to run a story on crypto’s latest goings-on. For example, on July 24 he predicted that Bitcoin's recent rally from around USD 6,200 to USD 8,000 would continue, with CNBC reporting, "The bitcoin rally is underway and crypto trader Brian Kelly said the digital coin will likely continue to appreciate in value." Sadly, this was wrong: after rising to about USD 8,200 on July 25, Bitcoin began sinking at the end of the month, plunging to just under USD 6,000 on August 14. In April, Kelly predicted that Q2 2018 would see Bitcoin recover from its poor first quarter of the year, which had seen Bitcoin drop from USD 14,000 on Jan. 1 to USD 7,000 on Mar. 31. "Q2 is always good for Bitcoin," he said confidently. Was he right? Um, no: BTC was down at the end of Q2 compared to the end of Q1, from USD 7,000 to USD 6,350 (on June 31). Bringing this tour of Brian Kelly's (many) mistakes to a premature end, the crypto maestro predicted on February 20 that Bitcoin would surge "even higher" than USD 12,000. Its price was at USD 11,500 when he made his prediction, but it then sank down to USD 9,500 by February 25, before reaching USD 11,600 on March 4 and falling again, to USD 7,400 by Mar. 18. And Mr Brian Kelly isn’t the only off-the-mark forecaster in Crypto Land. In May, Fundstrat's Tom Lee apologised for an inaccurate prediction of a Bitcoin rally that never materialised, while "the major Wall Street strategist" also predicted that BTC would hit USD 25,000 by the end of 2018. What's important to note about such predictions, is that they come from people who have a BIG interest in cryptocurrency prices. 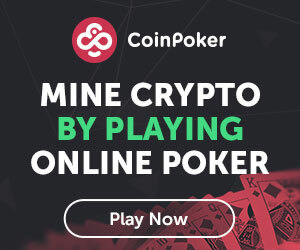 Brian Kelly's BKCM is an investor in Bitcoin, Ethereum and a variety of initial coin offerings (ICOs), Morehead's Pantera has also invested bigly in Bitcoin, Zcash and numerous other coins. And while Pompliano's Morgan Creek Digital Asset firm and Tom Lee's Fundstrat advise and broker rather than directly invest themselves, they still obviously do more business if more people are excited about the prospect of a bull market. There is, in other words, a conflict of interest issue here: outlets such as CNBC are reporting on the opinions and pronouncements of Brian Kelly without explicitly underlining the fact that such an expert stands to benefit from investors taking their predictions seriously. And in some cases the conflict of interest runs even deeper: CNBC, for example, is owned by Comcast, which in 2018 began investing in a variety of blockchain- and crypto-related startups. Of course, even without the 'experts' and their questionable motivations, the enterprise of predicting the crypto-market would still be a largely joyless one. Not only is this because crypto is still too immature and manipulable to be predicted with anything approaching accuracy, but also because forecasting even mature, traditional markets is often a perilous endeavor. "Stock market price prediction is fraught with many pitfalls," Gerald Ashley – an author and broadcaster focused on risk – tells Cryptonews.com. And such issues are compounded when it comes to currency markets, given that currencies – fiat and crypto alike – have no inherent, underlying value. “[Currency forecasting] has all the problems of stock prediction plus the issue of no recognised way of calculating the fair value of a currency,” says Ashley. “So it can be near impossible to know when a currency is over or undervalued." 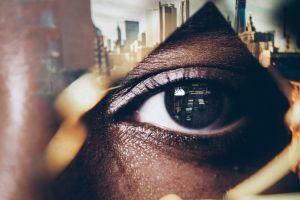 Taken together, these factors all imply that the next time you read a price prediction from an expert trader, you should probably take it with a large grain of salt. This column does not necessarily reflect the opinion of Cryptonews.com. Tim Draper on His USD 250,000 per Bitcoin Forecast: "Spirits Told Me"